As a destination that attracts a truly international clientele, Monte Carlo has a correspondingly varied restaurant scene with eateries serving up food from all corners of the globe. However, despite featuring the whole spectrum when it comes to international cuisine, the Monte Carlo principality has some mouth-watering Monégasque dining specialities of its own that shouldn't be missed. 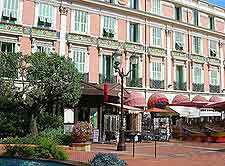 The majority of the restaurants within Monte Carlo are upmarket dining establishments, but visitors on a shoestring will find the fixed lunch menus offered at many eateries to be of good value. 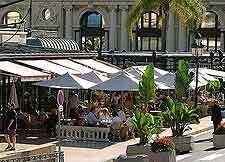 If budget is of no object then the sky is your limit in Monte Carlo, which features restaurants fit for royalty. 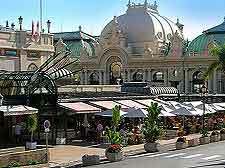 Dining in Monte Carlo is not just limited to restaurants. Upscale cafés line the harbour and the narrow streets of the Monte Ville district catering to diners with Tapas-style snacks and light bites. These al fresco choices make for the perfect place to people-watch. 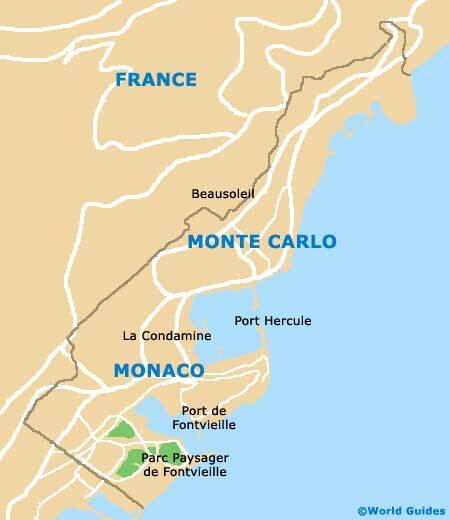 Dining in Monte Carlo is continental and visitors can expect cafés and hotel restaurants to open early for breakfast. Other eateries typically open for lunch between 10:00 and 11:00, with some establishments closing again in the afternoon at around 14:00 or 15:00 to prepare for the dinner rush. Dinner is eaten slightly later than in some other European countries, with diners arriving at restaurants anywhere between 20:00 and 22:00. Most eateries close by midnight but a few late-night options exist for night owls. Visitors to Monte Carlo may be challenged when it come to what to eat, as there is simply so much choice here. Eateries spanning Chinese, French, Japanese and Italian are spread across the city and serve up dishes that are typical of their respective cuisines. In addition to international cuisine, the city's plentiful restaurants offer fusion and brasserie dishes to make your mouth water. If you would prefer to dine on local specialities, you will not be disappointed, as Monte Carlo has a few national dishes of its own. 'Barbagiuan' is a tasty favourite that is eaten as a starter and combines rice with spinach, cheese and leek. Other popular appetizers include 'socca' (pancakes made from chick-pea flour) and Italian-style 'bruschetta' (toasted bread with an assortment of toppings, such as cheese, tomato, olives and anchovy). Monte Ville attracts diners with its quaint eateries, which offer remarkable views across the harbour. Naturally, those restaurants with the best views and locations are typically the most expensive, but you can find reasonably priced eateries and dining establishments amongst the upscale. 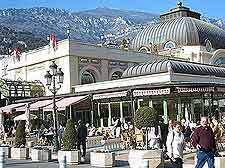 The Café de Paris is one of the best-known restaurants in Monte Carlo and has a prime position opposite the Grand Casino. Not only is the food excellent here but you also have excellent views of the sleek sports cars that regularly pull up to the casino. To splurge and enjoy some fine dining, head for the city's top restaurants - Le Grill de l'Hotel de Paris and Louis XV Restaurant. 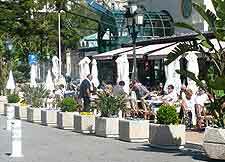 Port de Fontvieille is a good place to head if you want to eat by Monte Carlo's waterfront, but you can expect restaurants here to be priced accordingly. Cheaper bites can be had along the marina at the downscale beach bars, which serve snack food such as hot dogs and pizza throughout the day.